Identification: Viviparus georgianus is a freshwater prosobranch (gills in front of heart) snail species complex with a thin and smooth shell, yellow-green in color with a straight outer lip, often with four distinctive brown bands present on the body whorl (Clench, 1962; Mackie et al., 1980). The species complex has a very variable shell morphology, and the shell bands are sometimes absent (Clench and Fuller, 1965), but, it always has an adextral (right-handed) shell with 3-5 inflated whorls separated by deeply indented incisions. Size: One-year old snails are 12–17 mm; at 2 years, 17–21 mm; and at 3 years, 21–30 mm (Lee et al. 2002). The maximum height is 45 mm (Jokinen, 1992). Native Range: The banded mysterysnail is native to North America, generally found in waterbodies of the southeastern and midwestern United States, from Central Florida up to northern Illinois, and throughout the eastern part of the Mississippi Drainage (Clench 1962). It is unclear whether the native range of this species includes the Tennessee River Drainage, but it is likely introduced to the drainage given the absence of the species from very extensive surveys from shell collectors in the area during mid-late 1800s (Clench 1962). Nonindigenous Occurrences: It was first introduced into the Hudson River basin of New York in 1854 (Strayer, 1987), but the population failed. More individuals were released in 1867, resulting in an established population in the Hudson Drainage (Clench,1962; Strayer, 1987). The species was historically absent from most of the Atlantic coast drainages, and is known to have become established in the northeastern and midwestern United States as far back as the early 1900’s due to intentional releases, many from the aquarium trade (Clench, 1962; Mills et al., 1993; Dillon et al., 2006). Table 1. States with nonindigenous occurrences, the earliest and latest observations in each state, and the tally and names of HUCs with observations†. Names and dates are hyperlinked to their relevant specimen records. The list of references for all nonindigenous occurrences of Viviparus georgianus are found here. Ecology: This species is found in freshwater low-flow lentic streams, lakes, and ponds. It is often present with soft, silty and/or rocky substrates, but is present in a variety of habitats, including sand and detritus bottoms (Duch, 1976; Browne, 1978). It is usually absent from larger, faster-flowing rivers (Katoh and Foltz, 1994); however, it can survive conditions of high water velocity in the St. Lawrence River, and may even be better adapted than the introduced Bithynia tentaculata (mud bithynia) to such habitat (Vincent, 1979). Individuals are generally found in waters with pH between 6.3 and 8.5. (Duch, 1976; Wade and Vasey, 1976; Vincent, 1979; Jokinen and Pondick, 1981; Pace and Szuch, 1985; Jokinen, 1992; Lee et al., 2002). Viviparus georgianus often lives at high densities, sometimes up to 864/m2 (Lee et al., 2002; Pace and Szuch, 1985). It inhabits shallow waters, often amongst macrophytes, in spring to fall, before moving out to deeper areas to overwinter away from shore (Jokinen et al., 1982; Lee et al., 2002; Wade, 1985a), where it will burrow under the substrate for a period of inactivity (Pace and Szuch, 1985). In more open waters, fall migration begins earlier than in smaller lakes and ponds (Lee et al., 2002). Most growth generally occurs when waters become warmer in spring and summer, although reduced growth continues in winter (Browne, 1978; Jokinen et al., 1982). The lifespan of the female banded mysterysnails is typically between 28–48 months, while males live between 18–36 months (Jokinen et al., 1982; Lee et al., 2002). The group is sexually dimorphic with females growing larger and faster than males, and reproductive females usually larger than 16 mm (Browne, 1978; Buckley, 1986). Breeding takes place in the spring (Pace and Szuch, 1985). It is dioecious (distinctly male or female) and ovoviviparous, with females laying eggs singly in albumen-filled capsules and brooding them for 9-10 months; this species is one of very few gastropods to give birth to live young (Browne, 1978; Jokinen et al., 1982; Lee et al. 2002; Rivest and Vanderpool, 1986). Fecundity ranges from 4-81 young per female, but on average, is closer to 11 young per female (Jokinen, 1992; Vail, 1978). Females can brood more than one clutch of young at a time and the number of young in one brood is positively related to the size of the female (Vail, 1977). Some populations are known to reach sexual maturity within one or two years and reproduce iteroparously (more than once in life), while other populations have been known to breed semelparously (breed only once in life), not reaching sexual maturity until year three of life before dying (Dillon et al., 2006). Viviparus georgianus is known to be a facultative, or even obligate, filter-feeding detritivore (Browne, 1978; Lee et al., 2002). This species grazes on diatom clusters found on silt and mud substrates, but may require the ingestion of some grit to break down algae (Duch, 1976). With a variable diet, it will readily consume a herbivorous diet of algae and diatoms, but will also consume fish eggs (Duch, 1976; Eckblad and Shealy, 1972; Jokinen et al., 1982; Lee et al. 2002; Mackie et al., 1980). Means of Introduction: The earliest introduction of this species to the Hudson River drainage was made by an amateur conchologist who purposefully released around 200 of these snails simultaneously into the river in the 1850s (Jokinen, 1992; Mills et al., 1993). Later introductions were likely made via release from aquaria (Mills et al., 1993), but a one study found that this species is very resistant to desiccation, making it very capable of being dispersed over land via boat or other means (Havel et al., 2014). Status: This species is considered established in the waterbodies in which it introduced. Impact of Introduction: Viviparus georgianus has been shown to significantly reduce survival of largemouth bass eggs in guarded nests both in the laboratory and in ponds, and may contribute to high incubation mortality seen in natural field settings (Eckblad and Shealy, 1972). Various fish and bird species are known to feed on the snail (Eckblad and Shealy, 1972; Smith, 2007). This species is known to be the intermediate host for trematodes and has, as a result, been involved in spreading parasites to aquatic birds, resulting in large avian die-offs. In 2007, over 3,000 scaup and coots died in a Northern Wisconsin lake as a result of ingesting the infected, non-native snails, with many more birds unable to fly because of the infection. (Smith, 2007). This species has been documented in high densities where present, and to be more successful in the north, further from its known native range (Dillon et al., 2006). It is often the dominant member of the macrofauna in its trophic level, both in number and function (Browne, 1978). Because some populations of the banded mysterysnail are semelparous (dying off after one breeding event), this can create a large concentration of dead snails in habitats and leave behind significant shell debris (Dillon et al., 2006). Remarks: This species is very similar to the European Viviparus viviparus. It is possible that some introduced populations could actually be V. viviparus, which is a European species that is indistinguishable from V. georgianus (Mills et al., 1993). 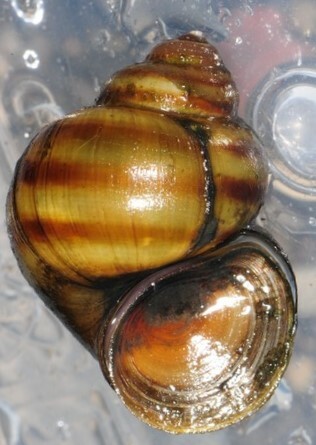 This species is also similar in shell shape and distribution with Viviparus intertextus and Viviparus subpureus (K. Cummings, Illinois Natural History Survey, pers. comm., July 24, 2018). Using allozyme data, Katoh and Foltz (1994) found that Viviparus georgianus is actually a species complex; speciation has occurred within the group in the southeastern United States due to the separation of populations by large rivers that act as barriers for dispersal. Three distinct species were found to be in the Georgia-Florida drainages, each grouping by drainage: V. georgianus formed a western group in the Choctawhatchee and Apalachicola River Drainages, V. limi formed a central group in the Ochlockonee River Drainage and southwestern Georgia, while V. goodrichi was found to be present in the most eastern rivers extending into the Florida Peninsula. The genetic identities of some populations remain undetermined, such as those of the Altamaha, Mississippi and St. Lawrence River drainages, and are therefore named as part of the V. georgianus species complex (Katoh and Foltz 1994). A later genetic study found populations introduced in New York to group with the western complex, Viviparus georginaus (David et al., 2017). Because it is a filter-feeding detritivore, Viviparus georgianus is a bioindicator of sediment contamination by oil and fertilizer, because growth, survival and histology are significantly affected by ingestion of contaminated sediments (Browne, 1978; Lee et al., 2002). This species’ migration, which typically results in individuals burrowing under mud during the fall and winter months, has led to an underrepresentation of the species during sampling (Pace and Szuch, 1985). Browne, R.A. 1978. Growth, mortality, fecundity, biomass and productivity of four lake populations of the prosobranch snail, Viviparus georgianus. Ecology 59(4):742-750. Buckley, D.E. 1986. Bioenergetics of age-related vs. size-related reproductive tactics in female Viviparus georgianus. Biological Journal of the Linnean Society 27(4):293-310. Clench, W.J. 1962. A catalogue of the Viviparidae of North America with notes on the distribution of Viviparus georgianus. Occasional Papers on Mollusks 2(27):261-287. Clench, W.J., and S.L.H. Fuller. 1965. The genus Viviparus (Viviparidae) in North America. Occasional Papers on Mollusks 2(32):385-412. Dillon, R.T., Jr., B.T. Watson, T.W. Stewart, and W.K Reeves. 2006. The freshwater gastropods of North America. http://www.fwgna.org/species/viviparidae/v_georgianus.html. Accessed on 03/12/2013. David, A.A., Zhou, H., Lewis, A., Yhann, A., and S. Verra. 2017. DNA barcoding of the banded mystery snail, Viviparus georgianus in the Adirondacks with quantification of parasitic infection in the species. American Malacological Bulletin 35(2):175-180. Duch, T.M. 1976. Aspects of the feeding habits of Viviparus georgianus. The Nautilus 90(1):7-10. Eckblad, J.W., and M.H. Shealy, Jr. 1972. Predation on largemouth bass embryos by the pond snail. Transactions of the American Fisheries Society 101(4):734-738. Havel, J.E., L.A. Bruckerhoff, M.A. Funkhouser, and A.R. Gemberling. 2014. Resistance to desiccation in aquatic invasive snails and implications for their overland dispersal. Hydrobiologia 741(1):89-100. Jokinen, E.H. 1992. The freshwater snails (Mollusca: Gastropoda) of New York State. New York State Museum Bulletin 482:vi -112. Jokinen, E.H., and J. Pondick. 1981. Rare and endangered species: freshwater gastropods of southern New England. The Bulletin of the American Malacological Union, Inc. 50:52-53. Jokinen, E.H., J. Guerette, and R.W. Kortmann. 1982. The natural history of an ovoviviparous snail Viviparus georgianus in a soft water eutrophic lake. Freshwater Invertebrate Biology 1(4):2-17. Katoh, M., and D.W. Foltz. 1994. Genetic subdivision and morphological variation in a freshwater snail species complex formerly referred to as Viviparus georgianus (Lea). Biological Journal of the Linnean Society 53(1):73-90. Lee, L.E.J., J. Stassen, A. McDonald, C. Culshaw, A.D. Venosa, and K. Lee. 2002. Snails as biomonitors of oil-spill and bioremediation strategies. Bioremediation Journal 6(4):373-386. Mackie, G.L., D.S. White, and T.W. Zdeba. 1980. A guide to freshwater mollusks of the Laurentian Great Lakes with special emphasis on the genus Pisidium. Environmental Research Laboratory, Office of Research and Development, U. S. Environmental Protection Agency, Duluth, Minnesota 55804. EPA-600/3-80-068: 144 pp. Pace, G.L., and E.J. Szuch. 1985. An exceptional stream population of the banded apple snail Viviparus georgianus in Michigan, USA. Nautilus 99(2-3):48-53. Rivest, B.R., and R. Vanderpool. 1986. Variation in capsule albumen in the freshwater snail Viviparus georgianus. American Zoologist 26(4):41A. Smith, D. 2007. Parasite has killed thousands of scaup. Star Tribune. Minneapolis, MN. 11/6. http://fwgna.blogspot.com/2007/11/ducks-snails-and-worms-when-invasive.html. Created on 11/06/2007. Accessed on 04/12/2018. Strayer, D. 1987. Ecology and zoogeography of the freshwater mollusks of the Hudson River Basin. Malacological Review 20:1-68. Vail, V.A. 1977. Observations on brood production in three viviparid gastropods. Bulletin of the American Malacological Union, Inc. 43:90. Vail, V.A. 1978. Seasonal reproductive patterns in 3 viviparid gastropods. Malacologia 17(1):7-98. Vincent, B. 1979. Étude du benthos d’eau douce dans le haut-estuaire du Saint-Laurent (Québec). Canadian Journal of Zoology 57(11):1271-2182. Wade, J.Q. 1985. Studies of the gastropods of Conesus Lake, Livingston County, New York, USA II. Identification, occurrence and ecology of species. Proceedings of the Rochester Academy of Science 15(3):206-212. Wade, J.Q., and C.E. Vasey. 1976. A study of the gastropods of Conesus Lake, Livingston County, New York. Proceedings of the Rochester Academy of Science 13(1):17-22. Author: Morningstar, C.R., Daniel, W.M., Larson, J., and Fusaro, A.